Almost everyone has experienced foot pain at some point in their lives. A 2014 study from the American Podiatric Medical Association (APMA) reported that eight out of 10 (77 percent) of Americans suffer from foot ailments. Since the feet bear much of the body’s weight, it’s no wonder people often run into foot-related problems. Foot pain negatively impacts your quality of living. APMA notes that half of the surveyed adults claimed that constant foot ailments restricted their activities — such as walking, working, exercising, or playing with the kids — in some way. The study’s participants added that they would exercise more (39 percent) and join more activities (41 percent) if their feet were in better condition. Despite the discomfort due to foot problems, only a third of Americans would seek a podiatrist’s help. APMA attributes this number due to the participants’ considering their feet not a priority. According to the organization, most people think of their feet as the least important body part in terms of their overall health and well-being. Your feet are part of your body, however. What happens to them now will affect the rest of your body in the future. Failure to address the pain will result in more problems and affect the function of your other body parts like the back, knee, and hip. 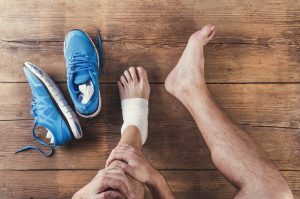 Instead of ignoring the pain, it’s best to visit your podiatrist as soon as possible to learn more about potential remedies, such as prescription orthotics. Customized orthotics are different from typical over-the-counter in-soles, which can be bought in stores without a prescription to make your shoes more comfortable but not correct your foot problems. As the name implies, custom orthotics are prescription shoe inserts that accommodate your unique foot structure and pathology. This medical device matches your feet’s contours precisely and follows the way you move. You can only get this prescription medical footwear after your podiatrist completes their evaluation of your feet, legs, and ankles. Orthotics also cost more than in-soles due to the customization, and they use top-notch materials that will last many years when cared for properly. Functional orthotics (Rigid orthotics) use materials like carbon, graphite, or plastic fiber and controls abnormal foot motion. Podiatrists recommend functional orthotics to treat foot strains and aches, as well as pain in the legs, lower back, and thighs. This type of prescription orthotics also treats injuries, such as tendinitis or shin splints. Accommodative orthotics (Soft orthotics) use soft compression materials to provide additional cushioning and support. They take the pressure off sore or uncomfortable spots due to diabetic calluses, diabetic foot ulcers, and plantar fasciitis. Because of their bulk, you’ll have to wear prescription footwear. Prescription orthotics function like shock absorbers by reducing the pressure from sore areas in the foot and ankle. They cushion the feet from the floors and hard pavement during the steps you take every day. These medical devices are effective first-line remedies for foot ailments that may otherwise require surgery or medication. Prescribed orthotics spread the pressure evenly around the feet, ensuring they hit the ground at the right angle. These also offer enough support to promote healing from foot injuries and deformities. By aligning your feet in a healthier position, overstretched ligaments and tendons relax, recover, and repair have time to themselves. Athletes also benefit greatly from orthotics. Since they are always training, they’re no strangers to injuries. Custom orthotics reduce injuries like twisted ankles and Achilles tendonitis by keeping the feet aligned. The technique minimize stress on the foot’s supporting tissues, which enables them to stay flexible and strong. If you are looking for extra support or cushioning, ask for an over-the-counter shoe insert first. When the discomfort is too much to bear, however, schedule an appointment with a podiatrist as soon as possible. During your appointment, your podiatrist will examine your feet and how you walk. They will take note of your complaints and assess the function and movement of your lower extremities. Some podiatrists use advanced technology to see how your feet function when you run or walk. The data gathered during your assessment will help your podiatrist determine if over-the-counter in-soles can remedy your condition or if you will benefit more from prescription orthotics. If the latter choice is your best option, they will take 3D images of each foot to look for signs of nerve damage or strained muscles. They use these images, as well as other obtained measurements, to create a precise mold of your feet. Your podiatrist may also recommend additional treatments to improve the function and comfort of your feet. The adjustment period usually takes about two weeks, but everybody adjusts according to his or her body’s own pace. During the first few days of wearing the medical footwear, you’ll feel a little uncomfortable since your foot’s soft tissues are adjusting to the pressure in different areas. It takes a while before your tissues get used to its new position. Start your transition by wearing your orthotics for an hour on your first day, two hours on the second, and continue to lengthen the time you use it each day. At the end of two weeks, you will feel more comfortable. If you still feel pain despite your new orthotics, consult with your podiatrist again. They will check for inflammations or make adjustments with your medical footwear. Your feet are the foundation of your body. When you keep them healthy, you keep your body healthy, too. Don’t ignore that constant stinging pain. Instead, schedule an appointment with your podiatrist today and start your walk to recovery.